While divorce is usually lower in Asian than in Western societies, a drastic rise in crude divorce rates has been reported in many East Asian countries in the recent past (Dommaraju and Jones 2011). Japan, South Korea, China, and Singapore, among others, have witnessed a two- to five-fold increase in the prevalence of divorce in less than four decades (United Nations Population Division 2009). 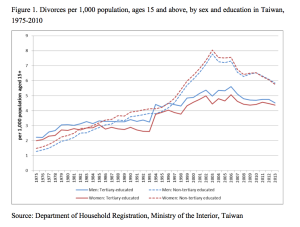 Taiwan is no exception: its crude divorce rates rose from about 0.3-0.4‰ in the 1970s to a peak of 2.9‰ in 2003 (2.4‰ in 2012), which is among the highest in East Asia and is also higher than that of several industrialized countries (OECD Social Policy Division 2015). 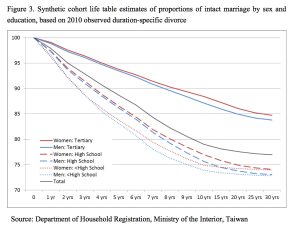 The drastic increase in the overall divorce rates masks an important fact: as Taiwan goes through industrialization and continues further into post-industrialization, social inequality is expanding across educational lines, with the less educated becoming more vulnerable to union instability than their better-educated counterparts. Divorce patterns vary not only across countries but also among social groups. Divorce differentials point to the fact that marital instability and its consequences are experienced differently across social lines. The general pattern in Western societies lines up well with Goode’s hypothesis (Goode 1993) that divorce differentials by education tend to be positive in countries where marital disruption is uncommon, and negative where divorce rates are high (Härkönen and Dronkers 2006; Matysiak, Styrc, and Vignoli 2013). In other words, divorce is at first a “privilege” of the elites; but, as it expands and “becomes popular”, it affects more and more the socially disadvantaged groups (De Graaf and Kalmijn 2006; Härkönen and Dronkers 2006; Martin 2011). 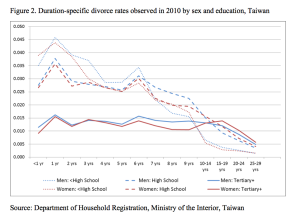 A recent study on the educational disparities in risk of divorce from 1975 to 2010 in Taiwan shows that, in this society, divorce differentials by education have changed from positive to negative (Cheng 2016). As shown in Figure 1, men with tertiary education used to experience higher risk of divorce in the 1970s and 1980s, but this pattern reversed in the early 1990s, and in the past 20 years divorce has been more likely among the less educated. The same reversal in educational patterns of divorce occurred even earlier for women in the 1980s. In addition, a closer examination of the age profiles of those who divorce indicates that young married adults under age 30 have been particularly exposed to the risk of divorce in recent years, and this holds true especially for women. Further investigation of divorce risk by duration of marriage based on the rates observed in 2010 also reveals clear educational variations (Figure 2). For men and women without tertiary education (high school degree or less), divorce peaks one year after marriage and then declines. Conversely, those with tertiary education have a relatively low and constant divorce risk across almost the entire span of their marriage life. It is only after 10 years of marriage that those with less education become less likely to end a marriage than their better-educated counterparts. And no trace of the famous “seven-year itch” appears in any educational group. With these duration-specific divorce rates, one can estimate the proportion of intact unions by duration. Figure 3 shows that about 11% of marriages would dissolve within 5 years, 21% within 10 years, and 23% before their 30th anniversary. Divorce risks are slightly higher for men than for women in all educational groups, and much higher among the low than the highly educated. The educational gap in the proportions of intact marriages between those with and without tertiary education expands rapidly after one year of duration: for instance, about 16-17% of marriages dissolve within five years for the less educated, but less than 7% for those with tertiary education. The rising prevalence of divorce, and its educational gradient, which affects both men and women, may result in social inequalities for the adults and children involved in these unions. The total number of single-parent families with at least one dependent child under age 18 in Taiwan has grown substantially from 284,500 in 2001 to 324,800 in 2010, which is about 12% of all families with at least one child under 18 in 2010 (Ministry of the Interior 2010). The ratio of single-mother to single-father families are about 6:4 in both years. In addition, the share of single parenthood caused by divorce has also grown from 57.4% in 2001 to 82.5% in 2010 (Ministry of the Interior 2010), with gender differences involved. A recent empirical study shows that 97% of single-father families were caused by divorce (vs. 78% of single-mother families), based on a survey conducted in 2006 (Cheng and Wu 2016). When compared with lone-mother families, a much larger share of single-father families are headed by low-income divorced fathers in 2006 than in 1998 (Cheng and Wu 2016). 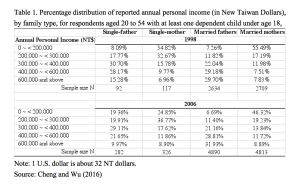 The economic advantage of single-father families over single-mother families also narrowed substantially in Taiwan (Table 1). 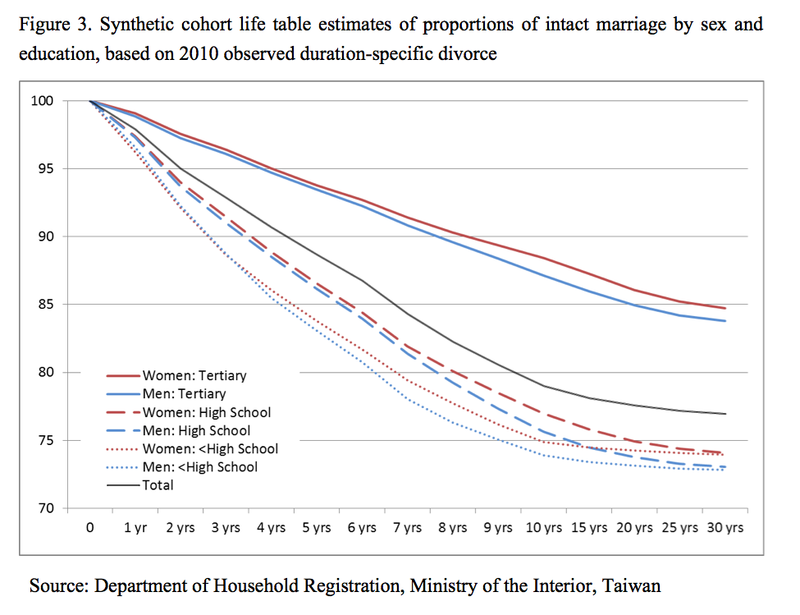 Moreover, in Taiwan marriage rates have declined much faster among the less educated men and women than among their more advantaged counterparts (Cheng 2014), and remarriage rates for the disadvantaged are lower among them than for the better educated (Ministry of the Interior 1975-2015). Overall, these patterns suggest that the less educated are and will be spending an increasingly large proportion of their lives outside a marital union, either as permanently single or as previously married individuals. As less educated individuals have less human capital and fewer socioeconomic resources at their disposal, the combined consequences of higher divorce risk and lower remarriage chances may more strongly impact their life outcomes, for instance by depriving them of the extra safety net provided by family support in old age. While policy makers and public discourses often focus on the disadvantages of single-mother families when considering the consequences of divorce, the findings here call for more attention to the well-being and development of all adults and children in disrupted families with limited resources. Cheng, Y.-h.A. (2014). 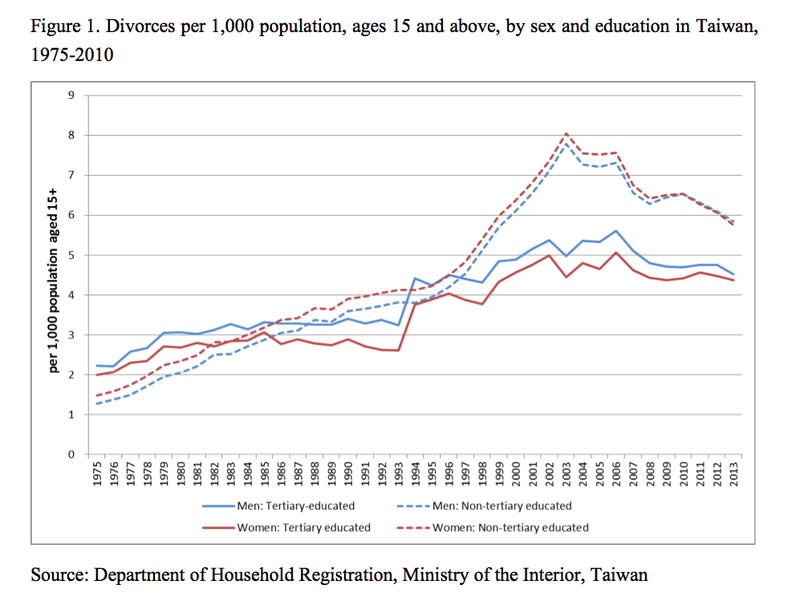 Changing partner choice and marriage propensities by education in post-industrial Taiwan, 2000-2010. Demographic Research 31: 1007-1042. Cheng, Y.-h.A. (2016). More education, fewer divorces? 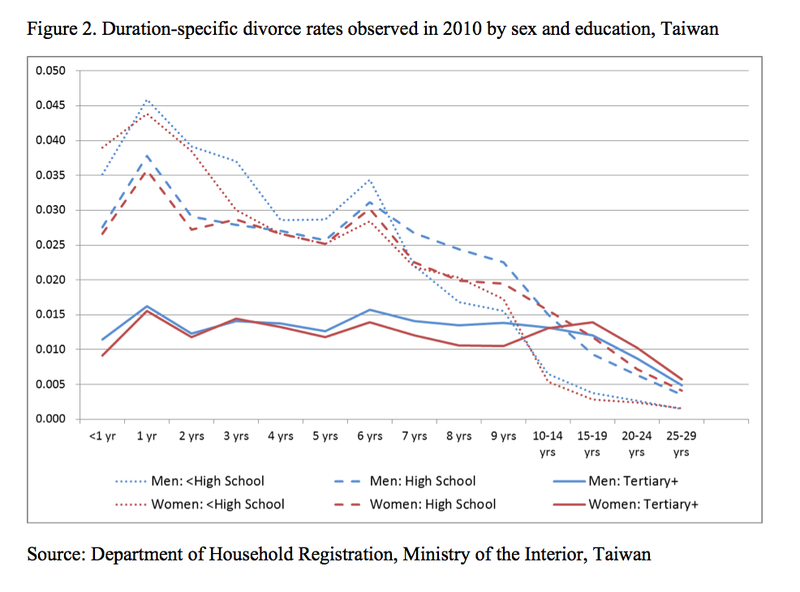 Shifting education differentials of divorce in Taiwan from 1975 to 2010. Demographic Research 34: 147-172. Cheng, Y.-h.A., and Wu, F.-c. (2016). 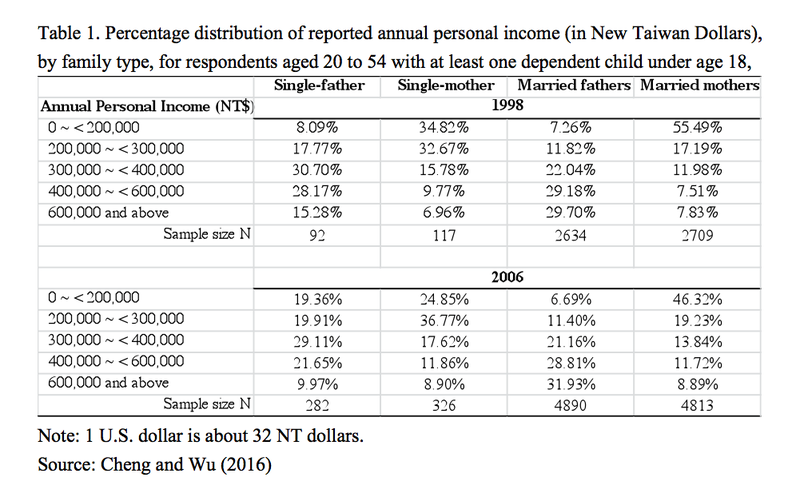 Going it alone and adrift: The socioeconomic profile and parental involvement of single-father and single-mother families in post-industrial Taiwan. Journal of Population Research 33: 147-172. De Graaf, P.M., and Kalmijn, M. (2006). Change and stability in the social determinants of divorce: A comparison of marriage cohorts in the Netherlands. European Sociological Review 22(5): 561-572. Dommaraju, P., and Jones, G. (2011). Divorce trends in Asia. Asian Journal of Social Science 39(6): 725-750. Goode, W.J. (1993). World changes in divorce patterns: Yale University Press. Härkönen, J., and Dronkers, J. (2006). Stability and change in the educational gradient of divorce: A comparison of seventeen countries. European Sociological Review 22(5): 501-517. Martin, S.P. (2011). Trends in marital dissolution by women’s education in the United States. Demographic Research 15(20): 537-560. Matysiak, A., Styrc, M., and Vignoli, D. (2013). 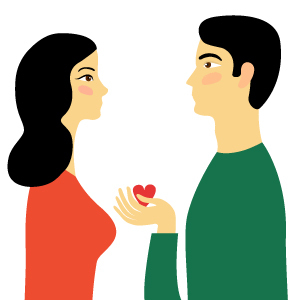 The educational gradient in marital disruption: A meta-analysis of European research findings. Population Studies 68(2): 197-215. Ministry of the Interior. (1975-2015). Statistical yearbook of the Republic of China, 1975-2015. Taipei, Taiwan: Ministry of the Interior. Ministry of the Interior. (2010). Single-parent family survey 2010. Taipei, Taiwan: Ministry of the Interior. OECD Social Policy Division. (2015). OECD family database [electronic resource]. United Nations Population Division. (2009). Crude divorce rates, world marriage data 2008 [electronic resource]. New York, NY: United Nations.